I can’t tell you how to survive any disaster. Nobody can. 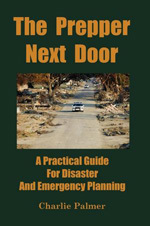 But over the years, as preppers, we’ve all learned some information about surviving various nasty situations. These are just my thoughts about what I consider five of the most likely emergency situations we’re likely to face. 1. Job loss. Not the zombie apocalypse or a nuclear war or even total economic collapse, just mundane job loss. Prepping is about making preparations before something bad happens. Once it happens, if you haven’t prepared, you have fewer options. This is especially true if you’re living paycheck to paycheck and you lose your job. Suddenly, life is difficult. There are many good resources on the Internet to help you prepare with job loss. As with anything, use the power of Google to learn more. If you have a month’s supply of food, to save on your grocery bill, you can invade that. Having financial reserves is best. Keep your resume and references current. If you suddenly lose your job, reduce unnecessary expenses right away. The sooner you act, the more likely you’ll keep your head above water. 2. Pandemic. Now we’re prepping! Why pandemic? It represents about the worst disaster where our preparations can make a difference. Those who have read my book know I’m a prepper from way back. I actually own and read one of the earlier editions of Nuclear War Survival Skills (link to online edition above) back from the 1980s. Do I think I can survive a nuclear war? No way. Do I think I’d have a good chance of improving my survival odds in a pandemic? Absolutely. The key is to isolate your family from contact with others as much as possible. Your supply of food, water, and cleaning products can make a difference. If you don’t have to venture out, there is less likelihood of contacting any socially transmitted illness. Concern of pandemic is in the news today, because of events in China. An editorial in The Star Tribune and others contemplate why tens of thousands of dead pigs and thousands of dead ducks are showing up in China’s rivers. They speculate this could be related to a virus. The Chinese government says it’s no big deal: Dead ducks just happen. Most of us know we can’t trust the Chinese government. The worry is that such a virus could mutate into a virus which could be transmitted from person to person. It could then spread worldwide. If a pandemic hits, there are extensive preps you could have taken. You could wear protective gloves, wear a respirator or air filter, seal a room in your home with plastic and duck tape and filter air into it. You could even wear a simple hazmat suit when you venture out and establish a decontamination zone prior to entering your house. Me? I’d probably just stay inside and bake cookies. Being able to hunker down for a month or two buys important time. Viruses don’t survive long when they kill off their hosts. They mutate into less harmful ones. Scientists would be scrambling for a vaccine. If you can hold up for a month or two, you have a good chance of surviving. If you don’t meet a lot of strangers, you live in the country, and you have a three month supply of food and water, you’ll almost certainly survive. 3. Earthquake. This is largely a regional problem. If you live where earthquakes are a concern, there are simple steps you can take to protect yourself. My motto of earthquake prepping would be: Construction, construction, construction. If you’re in a modern building up to code, the building probably won’t collapse. The advice then is to drop to the ground and cover yourself up as best as possible. I get a kick out of the people taking cover under an IKEA table in the link above. The idea is that if you’re under a table, a broken lamp won’t smash you in the head. Still, an IKEA table doesn’t instill confidence! Hiding under a table during an earthquake is common in modern areas. Most people survive, but they do get…ah…a little shook up. The link above is to a nice first person account of surviving an earthquake. Another nice account of the Christ Church earthquake is here. This site has a nice list of things you might want to secure. I don’t live in earthquake country and the table I’m at right now has pressed wood for legs. Furniture today isn’t built like it used to be. It’s much lighter. It’s seldom strong hardwood. Old growth dense-wood forest isn’t used for new construction of furniture. If you need to take refuge under a table, it should be a good one! If you can’t find strong tables, consider making your own. If you’re not handy with woodworking, but you know how to weld, maybe make one out of strong tubular steel with a heavy wood top. That could offer considerable protection. If you happen to be in a part of the world where shoddy construction is the norm, ducking under a table likely won’t save you from tons and tons of concrete falling on your head. Because you don’t want to get buried for a month, sipping sewage for sustenance, try to get out of the building and get far away from all structures. If the building density is high, you probably won’t be able to get to safety. Even if you make it to the street, buildings can fall on you. I don’t think you need to draw up a floor plan: You should know where the exits are in your own home! But the last two points in the second article are critical. In a fire, you might find you’re unable to open your eyes. Can you exit your home blindfolded? Keep low to the ground because that’s where the lowest concentration of smoke will be. In the book and in blog posts here, I’ve written extensively about preventive fire safety. That all applies. The best way to survive a house fire is not to have one! Fire safety applies to your home garage too. If you’re not careful, simple things can become serious, like this fellow who took his vehicle to a fast-oil-change-place and had his fuel filter replaced. His car burst into flames. 5. Home Invasion. This short Youtube lecture has some good advice about what to do to prevent/survive a home invasion. A home invasion occurs when undesirable people enter your home—murderers, robbers, in-laws. As with home fires, the best way to survive a home invasion is not to have one. Simple things like keeping your doors locked and not letting unexpected strangers into your home can minimize the dangers of this happening. Common advice is to have a “safe room” to retreat to. Have a weapon there so you can defend yourself. Have a phone so you can call the police. I would suggest you don’t rely on a chemical defense spray inside your own home, unless you have tested using them in confined spaces. As with most prepping advice, you need to adjust it to your own situation. If you’re ex-military or police, you might feel very comfortable moving around inside your home, even if there are intruders present. If your family is dispersed throughout the house, getting everybody to a “safe room” might not be easy. Some of the scariest home invaders masquerade as law enforcement officers. Others pose as repair people. If you have a bad feeling, don’t open the door and let the person/people on the other side of the door know you’re calling the police. You’ll open the door when you see police cars outside and when the police arrive. It’s easy to understand why violent home invaders pose as police. If a bystander sees what’s going on, it creates doubt in his mind. Maybe these are real police just doing their job. The bystander won’t call the police. It creates doubt in the mind of the defender too. If you see three guys in hoodies kicking your door, you’re not going to hesitate to grab your shotgun. If it looks like three police officers are trying to kick in your door, you’re much more likely to think they just made a mistake and have the wrong house. She said her children. He entered the house. I’m not a big fan of bluffing. But, maybe if she had said, “My husband, and my cousin who’s living with us. He’s a Marine back from the war and you know, he’s having problems with PTSD and he has these anger issues…please don’t hurt his pit bull.” that might have created just enough doubt to send the invader away. I’m not saying that’s the right or wrong thing to do. I wasn’t there so I couldn’t judge the guy’s demeanor. The most important thing in any disaster, emergency, or stressful situation is to try to keep calm and keep your wits about you. Think on your feet. Then roll with your decisions. In the chapter of the book talking about the prepper’s home, I introduced fireblocking, with a focus on basement remodeling and understanding the fundamental concept. Fireblocking is one of those topics that serious preppers should learn about. For preppers living in homes made before 1945, it’s possible your home has “balloon construction” exterior-wall framing. In a fire, these homes are an absolute nightmare. Once a fire finds its way into a wall, it will spread rapidly from any level up into the roof. Every winter, I see a news story about a home that goes up rapidly in flames where older home construction methods are blamed for the rapid spread of the fire. Balloon construction is the exact opposite of proper fire blocking. This Old House explains balloon construction. (I couldn’t get the video to play. I saw the program on TV when it aired). If your home has balloon construction, you should work to properly fire block it. This pdf goes into detail about fire blocking basics. It has nice pictures to illustrate the concept. As explained in the video, if fire finds its way into a wall cavity, the fire wants to consume oxygen. Openings around pipes and electrical wires create a path for air to flow into the fire, feeding the fire and pulling it into the wall cavity. Fire safety is an important topic for preppers. Fires are most dangerous when we’re asleep. We have smoke detectors to wake us up. Here’s a neat story about Cluck Cluck the pet chicken, who woke up his owners and saved them from burning. Here’s a nice article about winter driving on SurvivalLife.com. The biggest problem is that most people drive too fast in the winter and then lose control of their car. As the article says, if you lose control, you should try to steer in the direction you want to go. Keep these two things in mind and you’ll be safer than most people. The majority of Americans are against an “assault weapons” ban. Some 5’5″ lady pushed a guy onto subway tracks. While most preppers probably don’t take subways, this story provides a good lesson about self defense. Pay attention to your surroundings and personal space. If somebody is mumbling incoherently and then comes up behind you, you could be attacked. If you’re standing where somebody could bump into you and push you to your death, stand somewhere else.